A beautiful, elegant, and tropically modern home in Koh Samui, Villa Tree House is a unique holiday retreat amid lush tropical jungles with thatched-roof pavilions. The villa features contemporary interiors, dazzling surroundings, and modern comforts. Within walkable distance to the historical, and one of the last remaining old-world Balinese haunts, Fisherman’s Village, the villa provides both serenity and easy access to major areas in Bophut. The villa comprises four bedrooms; two of these are located upstairs with views that sweep across the jungle and two are located poolside. 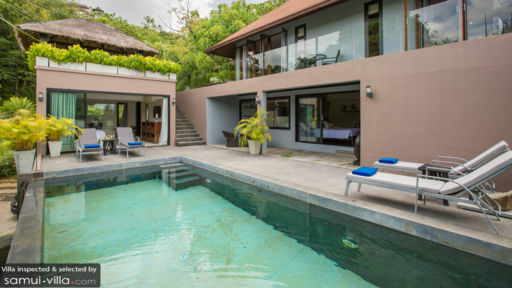 Villa Tree House is a classic, tropical villa that will be your home for the next few days. Four, splendidly-designed bedrooms are found on the two floors of the villa with two located just beside the swimming pool. Floor-to-ceiling glass doors slide open to reveal the gorgeous bedrooms that are furnished with king-sized beds and feature minimal, elegant décor. Shades of grey, blush coral, and natural wood dominate the space. There are unique designs in each room such as a bamboo wall with whole stalks, plant pots, and hardwood floors. The upstairs bedrooms reveal spectacular views across the jungles to the horizon for an excellent start to your day. 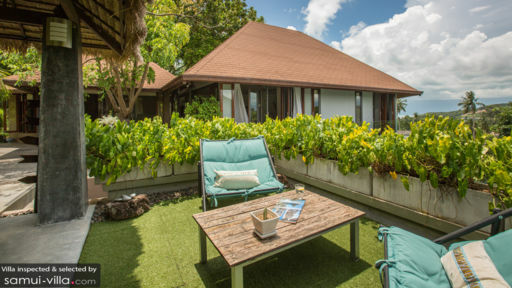 All the bedrooms are air-conditioned and feature luxurious, well-designed open-plan ensuite bathrooms with walk-in shower, natural stone basins with bamboo taps, freestanding bathtubs, and amazing views. Nestled amid the verdure of tropical jungles and luscious flora, the magnificent outdoors at Villa Tree House is marked by many of nature’s splendour. The dazzling swimming pool resides centre-stage, flanked by a privacy screen made of bamboo. Beyond the fencing lies vast acres of forestland. The pool deck is made out of wooden planks and houses sun chairs for sunbathing with some lemonade. Steps from the pool deck lead to the upper-level where, under the shade of a thriving tree, you will find the alfresco-style, romantic dining area for a memorable feast with loved ones. A small patch of well-kept gardens also houses a quaint seating for two. The main living pavilion at Villa Tree House is located on the upper floor as well. It is a vast, well-lit, and airy space that opens out to the upper deck through glass doors. Offering views of the lush neighbourhood, the contemporary living room is done up in pastel shades. Flanked by a wooded terrace, the living area inspires an indoor-outdoor living situation. The wooden flooring indoors is housed with comfortable, plush wicker seating, a TV, and the room is air-conditioned. Beside the lavish sitting area, you will find the open-concept, fully-equipped modern kitchen featuring granite countertops, wooden cabinets, and top of the line amenities. The breakfast bar is accompanied by wood-log inspired stools. For dining, there is an alfresco area right outside, or make your way to the thatched-roof sala which houses another dining area for guests. The villa is fully-staffed to provide guests with basic amenities and services such a housekeeping, guest assistance, etc. Special services such as babysitting, private chef, and massages in-house require bookings managed by the staff and additional expense on behalf of the guests. 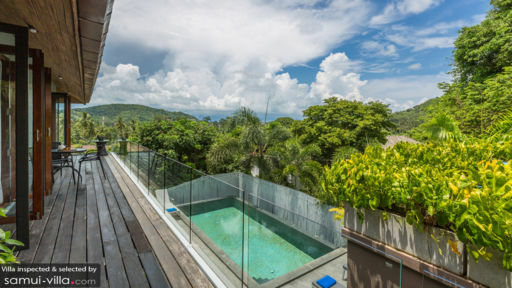 Villa Tree House is located near the white-sand beach of Samui with pristine views and spectacular sunsets. The famous Fisherman’s Village in Bophut is five-minutes away where you have old-school buildings converted into boutique shops, restaurants, etc. Head to the Big Buddha to sightsee among other things.